While I was traveling, a friend once told me that a person who is open to new foods truly is a person with an open mind. Anyone can talk about being open to new adventures and ideas but people cannot fake enjoying unfamiliar foods. He was right. I’ve since watched people and their reactions to new foods for clues to their tolerance for new adventures and ideas. However, while humans can be creatures of habit, they can also learn new behaviors. Take me for example, I grew up pretty much a meat and potatoes guy (okay, maybe meat and rice guy). This is probably hard for some of my current friends to believe, but I was heavily influenced by a few American families that I lived with as a youngster. On my first date with my wife Shari, however, she enthusiastically asked to go to a sushi restaurant. Until then, I’d only tried sushi once before and was repulsed by it. But wanting to make a favorable impression, I tried to swallow a plate full of sushi, only spitting back out the really fishy ones onto a napkin without detection. infatuation is an amazing motivator. Since then, sushi has become one of my favorite foods. Furthermore, I’ve learned to really enjoy trying a wide variety of foods. Such meal time adventures are one of my greatest pleasures now. In fact, I now get really bored with standard American cuisine and try to avoid it as much as possible. This has caused some problems at times. 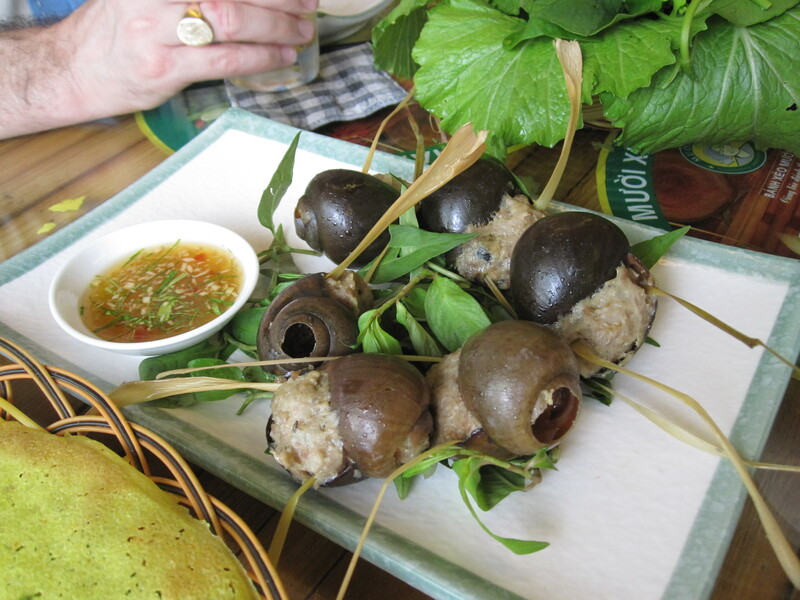 With my frequent trips to Vietnam, I’ve really learned to enjoy the various types of snails in the different sumptuous sauces. Recently, these along with too much other shell-fish and an excessive amount of beer caused my first and only (fingers crossed) outbreak of gout. That was painful. Nonetheless, I had to try some snails again on my last trip. They are just too delicious to completely avoid. My life mirrors the changes in my appetite for different foods. As I’ve traveled and learned so much about different cultures, I’ve become bolder and bolder with what I’m willing to eat. That change in perspective has enriched my life beyond imagination. I sometimes think back to that first date and wonder how different my life would have been if Shari had NOT been an adventurous eater herself? My point is this, anyone can learn to open up their appetite to new adventures whether doing so is natural or difficult. The reward, I promise, is beyond your current comprehension. Posted in Lifehacks and tagged adventure, cuisine, food, snails. Bookmark the permalink.